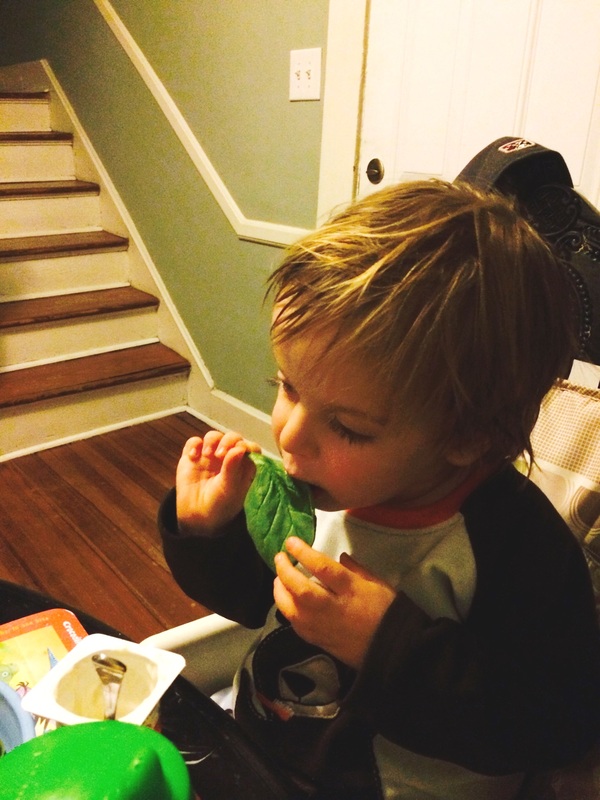 That’s my kid eating spinach. Victory. Life is busy and chaotic and there is both too little and too much to report. On my radar this week has been the random things that come out of William’s mouth. I often curse like a sailor and I thought having children would curb that. I was very wrong. William is great at repeating the word right as it comes out of my mouth. But suddenly, he now will say, “Mommy, can I say that?” It’s as if he knows by the tone or the way I say the bad word that he should question his ability to say it. It’s a miracle, really. William can no longer go to bed without a spoonful of peanut butter. He also insists that he receive “fresh” water in his nighttime cup. If we forget, the minute we get to his room he says, “But I NEED my peanut butter!” He is clearly my child. While we don’t regularly attend church and William’s only knowledge of “church” is through the Godly Play activities they do on Wednesdays at his daycare, I have started asking him to say “Thank you” to God each night for all of the people or places or experiences or things he is thankful for. It’s such an eye opener to hear what he will think of. He is quick to include all of his immediate family, specifying “My Noah” and then the list includes random things like shoes, peanut butter, trains, cake and milk. Sometimes he asks that we start the list over and go through the things multiple times. My great hope is that it instills mindfulness for all the things we are thankful for. Out of nowhere, William has started telling me that I’m his best friend, followed by a kiss and a lean-in hug. He also told my mother that I’m his girlfriend, he loves me and he helps Daddy make me coffee. It is not uncommon for William to ask Brandon or I at the dinner table, “Do you need a beer?” I promise we don’t drink daily at the dinner table or ask him to fetch us a beer. But, that’s an idea.